Repetitive overhead activity or throwing may lead to repeated microtrauma in the AC joint with susequant arthritis. May occur after Grade 1 AC separations. Diarthrodial joint which contains a meniscus. Allows approximatley 40° to 50° of rotation. Pain along the anterior and superior shoulder; isolated to AC joint. AC joint palpation reproduces symptoms. May have radiation into the trapezius and anteriolateral neck. Evaluate for hx of AC joint separation, generalized OA, weight lifting (distal clavicle osteolysis), repetitive stress (gymnastics). 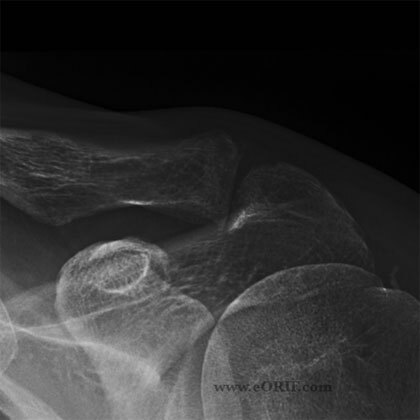 AC joint best viewed with a Zanca view of clavicle. Weighted views indicated if instability is a concern. AC joint local anesthetic and corticosteriod injection often indicated to confirm diagnosis. Relief of symptoms after injection confirms AC joint pathology as the cause of symptoms. Operative: open vs arthroscopic distal clavicle resection generally considered only after failure of 3-6months of non-operative treatment. Open excision may be indicated for patients with hypertrophic osetoarthritis. RTC Tear: usually partial-thickness articular sided supraspinatus tears. 71% excellent, 16.5% good, 12.5% failure (Levine WN Arthroscopy 1998;14:52-6). Post-op: sling as needed with pendulum ROM exercises. 1 week: Start PT focused on ROM and strengthening. AAROM, PROM. AROM, free weights start at 3 weeks. Avoid cross-body adduction for 6 weeks. 6 weeks: progressive sport specific activity. 3 months: Return to sport / full activities. IF in association with SAD, or RTC repair use those rehab protocols. Outcome measures: ASES score, pain scales.